Put the gelatine in a bowl of cold water to soak. Measure the custard powder into a large bowl, add 3 tbsp of the milk and mix to a paste. Heat the remaining milk and 100ml of the double cream in a small pan. When steaming, pour over the custard paste and whisk until smooth. Pour back into the pan and heat, whisking continuously until thick. Remove from heat. Squeeze excess water from the gelatine leaves and whisk these into the custard. Rinse the bowl, pour the custard back in, then cover the surface with cling film. Grease a 23cm springform tin and line with a double layer of cling film to cover the base and sides. Wrap the outside of the tin in foil – this will catch any jelly leaks. Blitz the biscuits to fine crumbs, add the butter, and blitz again. Tip the mixture into the base of the tin and push down firmly with a spoon. Put the cream cheese, sugar and vanilla into a large bowl, and mix together using an electric hand whisk until well combined. Give the custard a quick whisk to loosen it a little, then add to the cheesecake mixture and whisk to combine until smooth. Pour into the tin and level the surface. Tap the tin to knock out any air bubbles (it’s essential there are no gaps between the cheesecake and the cling film or the jelly will flood out in the next step). Chill for 4 hrs. Make up half the jelly following pack instructions, then leave to cool for 30 mins. Pour over the cheesecake, top with frozen berries and put in the fridge for 1 hr. Make up the remaining jelly 30 mins before removing the cheesecake from the fridge. Pour over the second layer of jelly and leave to set for 1 hr more. Put the remaining cream, icing sugar and Sherry (if using) in a bowl and whisk until softly whipped. Transfer to a piping bag. 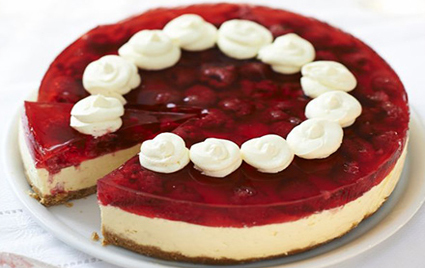 Remove the cheesecake from its tin, peel away the cling film.Place on a plate and pipe cream around the edge. Best served on the day, but will keep in the fridge for 3 days.